Dove is a beautiful stocky bird. It has short legs, small head and a beautiful cooing voice. Seeds and fruits are dove’s food. Doves and Pigeons are delicate birds. Generally doves are smaller in size and more delicate than pigeons. Dove comes from the family Columbidae. This family also includes pigeons. Sometimes, it is difficult to make comparison between dove and pigeon. That’s why used interchangeably. Biologically, there’s no differences between doves and pigeons. 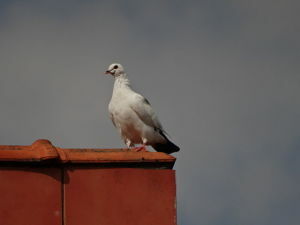 Commonly, small birds are doves and larger are considered as pigeons. Doves pair is for life as it is a beautiful couple and it lay 1 to 3 eggs and takes 19 days to hatch. Both loving parents incubate their eggs, male dove in the morning till afternoon, so as female dove in the afternoon to mid morning next day. Dove feed them a milky liquid. Dove or Pigeon presence may cause harmful effects such as their droppings – feathers, and other waste materials like fece, moreover their nests demean the worth of property. Their feces or other waste material can cause complications on health too. Pigeons and Doves carry a lot of bacteria and it supposed to be lethal. It is very important and necessary to adopt a best pest control company like Exopest after realizing its pros and cons and the Pigeon Control Products. Surely at Exopest we have the most humane techniques for pigeon control and dove control. Exopest services work effectively in Dove control and Pigeon Control. Exopest is very cautious for your health and will provide you best and long lasting facilities regarding Pigeon and dove control. Exopest deals with the latest methods of Pigeon Control and dove control and inform you to keep your children away from the bird debris accumulated area. Our pest management professional will definitely provide you a comprehensive inspection which is based on the findings of infestation. We believe in the best that is why we prepare an efficient plan which work actively for you and help you in reducing and eliminating your problems related to Bird Control, talking more specifically dove control and Pigeon Control. Call now at 604-760-1542 for Free Evaluation, OR Click Here for a FREE Quote.